In addition to the traditional Lenten practices of prayer, fasting and almsgiving, it is both praiseworthy and traditional to engage in spiritual reading during this season as well. 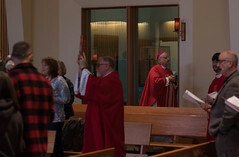 This accords with the nature of the season itself: the six weeks of Lent and Holy Week are the Church’s annual retreat and this time is intended to provide us with the opportunity for personal spiritual renewal. In that spirit, what follows are some suggestions and resources that are for the practice of daily Lenten spiritual reading. The lectionary has assigned specific readings to be proclaimed at Mass for each day of Lent: one from the Old Testament, a responsorial psalm and a passage from one of the four Gospels. 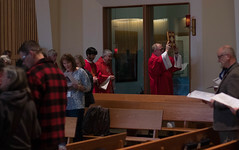 They are arranged in order, to highlight in sacred scripture some dimension of Christ’s call to repentance and conversion and to the Lenten practices of prayer, fasting and almsgiving. The Office of Readings is a part of the Church’s other form of public liturgy, The Divine Office or Liturgy of the Hours. During the six weeks of Lent in the Office of Readings, the Book of Exodus is read continually for the first three weeks, followed by readings from Leviticus and Numbers during the fourth week, concluding with a continuous reading of the Letter to the Hebrews during the fifth and sixth weeks. Each daily scriptural reading is paired with a short commentary from the Church Fathers or other spiritual writer on the biblical text. The Office of Readings for Lent can be found in the Second Volume of the four-volume set of the Liturgy of the Hours (Catholic Book Company) and is also available online. A great way to prepare for the upcoming diocesan Catholic conference in September “Living and Sharing the Joy of the Gospel” is a prayerful reading of Pope Francis’s 2013 apostolic exhortation, “The Joy of the Gospel”, in which he invites us to become a Church of missionary disciples. It has many more chapters than there are days of Lent, but there are at least two downloadable study guides (see Resource sidebar) that have organized the entire document around six major themes, with individual or group discussion and reflection questions, which could be read and reflected on during each of the six weeks of Lent. This book is available from the USCCB and has a daily reading for each day of the Lenten and Easter seasons. Each reading has a brief introduction on the theme of the day and short paragraph by one of the Fathers of the Church. This is a collection of forty-seven short conferences on prayer given by Pope Benedict between 2011-2013 as part of his General Audiences. Despite the title, most are reflections on prayer in sacred scripture and on the prayer of Jesus. Each short chapter on prayer can be read as a daily reading, beginning with the scriptural passage upon which the Holy Father bases his reflection. A beautiful way to pray and engage in spiritual reading during Lent is to do so in the presence of the Blessed Sacrament. Fr.Ranly, a missionary priest serving in Peru, wrote this collection of short meditations for his parishioners when they gathered each Thursday for two hours of Eucharistic adoration during the Jubilee Year in 2000. The thirty-two reflections of this pocket-size book are not intended to be read in sequence, but as seems suitable for the season of the liturgical year or by theme. Chapter 4 of the Rule of St. Benedict is entitled “The Tools of Good Works” and is a list of seventy-two spiritual practices that St. Benedict considered to be essential to the Christian (and monastic) life. Taken as a whole this chapter is a challenging examination of conscience regarding prayer, fasting and almsgiving as well as an urgent call to conversion and encouragement to a deeper reliance on God’s love and mercy. Fr. Casey invites readers to draw on their own experience and insight in applying each reflection to their own lives. With the introduction and thirty-one chapters, it can be read as a daily reading during the weekdays of Lent. This book consists of fifteen conferences on the Beatitudes by the novice master at the Carthusian monastery of the Grande Chartreuse in France. Each conference builds on the preceding conference. Although directed at novices in the monastic life, the conferences, all of which are grounded in the Beatitudes, have much to teach about discipleship, prayer and growing in holiness. Every year on the first Sunday of Lent we read of how Jesus was driven by the Holy Spirit out into the desert for forty days where he fasted and prayed and struggled against the temptations of the evil one. In imitation of Jesus, Christians in the fourth and fifth centuries went out into the deserts of Egypt and Syria to seek a closer relationship with God in the solitude of the wilderness. This book is arranged in twelve chapters, one for each month, with a daily reading from one of the desert fathers and mothers and a short commentary by the author. The topics for February and March , respectively “The Cell” and “Praxis: Caring for One’s Soul”,are particularly suited for Lent. These are just a few suggestions for spiritual reading from my own personal favorites and which I have found helpful and recommend. It is by no means an exhaustive list and no doubt there are many other books and authors that might be better suited to your own unique journey of faith. But what is important is to find a way to create space amid the many demands on our time and attention to examine our lives, make time for regular prayer and deepen our conversion to Christ and the gospel.